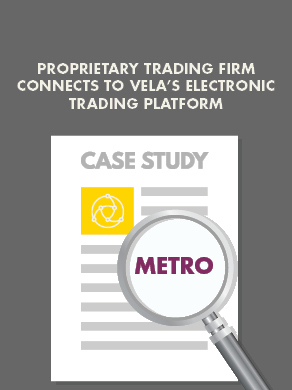 London, New York, 26 April, 2017 – Vela, a global leader in high performance trading and market data technology, has launched a fully-managed European Best Bid Offer (EBBO) solution in response to increased client demand to comply with the changing pre-trade transparency and best execution rules which will come into force with MiFID II in January 2018. The EBBO solution aggregates market data from multiple primary exchanges and multilateral trading facilities (MTFs) across Europe to provide a consolidated view of liquidity for a given instrument. It calculates both top of book and market depth in real time and updates with each underlying tick. Clients have the flexibility to customise these venues based on their best execution policy. Built on Vela’s SMDS ticker plant technology, the EBBO uses a single process for data retrieval, data normalisation, consolidated book construction, and distribution via either multicast or transmission control protocol (TCP). SMDS offers an industry-leading latency profile and a low hardware footprint whilst offering high performance and throughput. SMDS already powers an equivalent Vela product covering US venues to provide a faster alternative to the Securities Information Processor (SIP). Vela’s EBBO is available as a fully managed service in Equinix LD5 or can be deployed on premise within a client’s own environment and managed either by Vela or the client.